Pregnancy is the beginning of a significant psychological transformation for parenthood. This is a quite complex psychological process of establishing a new identity a parent. These symptoms are temporary, mild, quite normal and common during pregnancy. Therefore, pregnant women should be reassured. However, if the symptoms are persistent and significant, and having an impact on the quality of life, then a further assessment is needed to rule out any mental health condition. All these (except prenatal attachment) are described in detail below. This is the change of mindset with regards to the relationship with other individuals. After the arrival of the baby, the woman’s (and the partner’s) relationship with others family members (such as her own mother and other children) takes a new shape due to the changing roles. – the relationship with the partner/ family. – the culture/customs of the community she belongs to. Now we are going to discuss the above factors in detail. A) What is Reflective Functioning? Every human behaviour/ action is a reflection of their state of mind (also called ‘mental state’). Broadly, the mental states which regulate human behaviour/ actions are feelings, intentions, thoughts, desires, and beliefs. A key aspect of the human relationship is to understand their own and others’ mental state to make sense of (and anticipate) their own and others’ behaviour and actions. Therefore, the capacity of RF makes our own and other’s actions more understandable, meaningful, and predictable. The psychological process of understanding their own and others’ mental state in relation to any action/ behaviour is called mentalization. The capacity of an individual to mentalize is called Reflective Functioning (RF). RF is important not only for maintaining a good relationship but also for the regulation of own emotions. 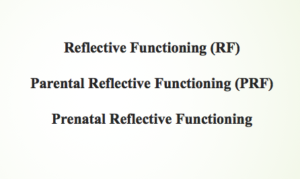 Reflective functioning could be assessed by the use of RF Scale. This was designed on the basis of the Adult Attachment Interview (AAI). The RF Scale has been adapted to be used with other forms of AAI, such as Parent Development Interview (PDI) and Pregnancy Interview (PI). The Reflective Functioning of an individual is now thought to develop in early childhood years and closely linked with the development of a secure parent-infant attachment. B) What is Parental Reflective Functioning (PRF)? The Parental Reflective Functioning (PRF) is the term used to describe the Reflective Functioning of the parents in relation to their children (in their caregiver’s role). 1. The capacity of the parents to understand his or her own mental state behind a behaviour/ action. 2. The capacity of the parents to understand the child’s mental state behind a behaviour/ action. 3. The appreciation that a behaviour/ action is a reflection of the individual’s mental state. 1. Deficient: this is where the PRF is much less than expected. 2. Excessive: in this case, the parent has a significant uncertainty of the child’s mental state. The parent could also have a distorted image of the mental state of the child or paranoid thoughts. PRF is considered by many to be a distinct entity during the mentalization process throughout the entire life. Reflective Functioning of the caregivers helps children to develop their own mentalization process. This is important for their own regulation of emotions and future relationship with others. During infancy/ early childhood, the communication of the child is mainly non-verbal. Therefore, parents/ caregivers get the opportunity to understand the mental state of the child by observing their emotional and behavioural cues. PRF helps the parents (or caregivers) to read the mental state of their children. As a result, parents can anticipate and understand the actions and behaviours of their children. Therefore, researchers believe that PRF plays a crucial role in the intergenerational transmission of attachment. Very often, RF/ PRF and mind-mindedness are used interchangeably as they are closely related. But strictly speaking, they are two different terms/concepts coined by two separate researchers. Fonagy et al. (Ref 3) described the concept of RF and Meins et al. suggested mind-mindedness. C) What is Prenatal Reflective Functioning? At present, there are more focus and recognition of the role of Parental Reflective Functioning during the pregnancy period. This is also called Prenatal Reflective Functioning. Studies indicate that prenatal (and postnatal RF) improves parenting behaviours. – Sensitivity: this is the readiness/ capacity of the parents to respond to the child’s needs in an appropriate and timely manner. – Intrusiveness: this is the extent/ degree to which the parents manage the behaviour of the child forcefully. Research has shown that a better RF of the mother during pregnancy is associated with less emotional/ behavioural problems of the child. Researchers now believe that this is possible due to better parental behaviour (mediated through better prenatal RF). What are the factors which can impair effective prenatal RF? 1. Substance misuse (drug/ alcohol problems). 2. Lack of family/ social support. 3. Untreated mental health conditions during pregnancy. 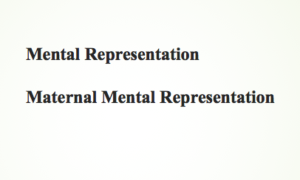 What is the Mental Representation? Mental Representation is the imagination of things that do not exist in reality and/ or have never been experienced. This is also known as Mental Imagery or Cognitive Representation. Mental representation during pregnancy is a unique phenomenon for both parents. 1. Psychological adaptation during the transition to parenthood. 2. Adequate parenting behaviour and attitude. 3. Playing an important role in the development of secure attachment and child’s own RF. Representation by the pregnant woman is known as Maternal Mental Representation. 1) Representation of herself as a mother to the growing fetus. 2) Representation of the baby as a separate individual. 3) Representation of the partner as a parent. 4) Representation of her own mother as a grandmother. The pregnant woman’s own Attachment Style can influence her mental representation during the antenatal period. Maternal representation about the baby and herself as the mother develop gradually during pregnancy. By the third trimester, the representation becomes quite structured and consolidated. 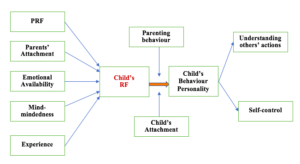 Working Model of the Child Interview is the tool used to measure the Maternal Mental Representation. This is equally important for the fathers for a smooth transition to parenthood. Sometimes, mental representation could be difficult for the partners as they do not undergo the same physical changes as the pregnant women. Pregnancy activates the object relationship of the pregnant woman with her own mother. She envisages herself ‘as a mother’ by identifying with her own mother. The object relationship with the mother helps the pregnant woman to develop the motherhood identity. 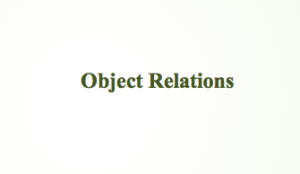 Read more about the concept of object relation here. During the transition to motherhood, certain specific fears/ worries preoccupy the mind of the woman. All such worries/ concerns are called together as the Motherhood Constellation. This relates to the fears/ worries a pregnant woman would have whether she could be a good enough mother. 4. Does not fall by accident or by her mistake. 5. Continues to grow and thrive. These thoughts/ fears could make a pregnant woman very vulnerable to the judgment and criticisms of others. This theme also explains why a pregnant woman has normal fears of pregnancy loss (such as miscarriage/ stillbirth), baby having birth defects (such as congenital heart disease or neural tube defects) or baby will not be a ‘monster’. This is one of the reasons why the pregnancy and childbirth could be stressful, even if the society expects the mothers/ parents to be happy. This theme describes a mother’s fears whether she would be able to bond with the newborn and love the baby (what the society/ community expects for every mother to develop naturally). This fear is especially related to the period until the baby can speak. 1. Would she be able to love the baby? 2. Would the baby lover her? 3. Would she be able to understand the nonverbal cues of the baby and respond promptly? 4. Would she be a ‘natural’ mother as the society expects her to be? She could have a fear of failure as a mother and unable to carry out the above. Such worries and concerns of the mother are significantly influenced by the cultural values/ traditions. This is the fear of inability to have a robust support network after the childbirth. She might also worry about feeling isolated, lonely, and helpless. Her own childhood memories of care by her parents play an important role in this transformation. She often uses her mother as a role model. This helps in the intergenerational transfer of family values and principles. As discussed above, there are certain specific psychological stressors arise during pregnancy. The pregnant woman (and the partner) can become vulnerable to the psychological stress and mental health problems. Every individual is different in their ability to cope. 5. A robust support network from family/ friends/ Peer Support. 7. A capacity for sound Internal Reorganisation (this includes Reflective Functioning, Mental Representation, and Objective Relations). 8. A capacity for sound External Reorganisation. 3. Insecure Adult attachment styles. 4. Bad experiences of childhood (such as a victim of neglect/ abuse/ maltreatment, poor parenting, witnessing violence while growing up). 5. Lack of a support network. 6. 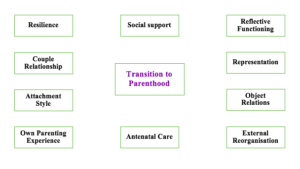 Poor antenatal care and care during labour with traumatic experiences. 7. Impaired capacities for Reflective Functioning, Mental Representation and Object Relations. This could happen due to several factors including substance misuse, untreated psychiatric conditions, poor couple relationship, domestic violence and a lack of a positive role model (especially of her own mother). How do the personal expectations influence the overall pregnancy/ birth experience? – Personal experience (such as previous pregnancy or witnessing someone’s pregnancy/ birth. Every pregnancy journey and experience is unique. Therefore, the expectations could be quite different from the actual reality. Healthcare professionals should make every effort to explore the expectations. Appropriate explanations should be given to addressing fear and concerns. The pregnant woman (and the family) should be at the center of care and all the decision-making process. Expectations could have a significant impact on the pregnancy/ birth experience. This is especially important if the high expectations are not met when she could experience a traumatic experience of pregnancy/ birth. 1. 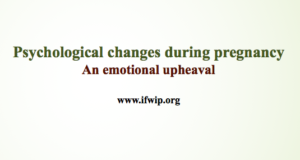 Pregnancy is a time of significant psychological change. Therefore, pregnant women (and partners) could be vulnerable to develop perinatal mental health illnesses. 2. Emotional lability/ fluctuations (between positive and negative feelings) are common during the entire pregnancy. Many pregnant women have less negative feelings during the second trimester (compared to the first and third). 3. Mild and temporary negative emotions (such as low mood, fear/ anxiety, ambivalence, conflict, and regression) are common. Therefore, pregnant women should be reassured. However, if the symptoms are persistent, severe (especially with a significant impact on the quality of life) then further assessment should be done to rule out a psychiatric illness. It is important to remember that pregnancy is NOT protective of mental health conditions. 4. An important change is the activation of Internal and External Reorganization. This includes important psychological processes, such as Reflective Functioning (Parental and Prenatal), Maternal Mental Representation, Object Relations, and Prenatal Attachment. 5. Maternal Constellation is a group of worries/ fears a mother is likely to have during the transition to parenthood. These could make the transition stressful. 6. Good mental resilience, social support network, couple relationship and childhood experience could ensure a smooth and enjoyable transition to parenthood. 7. Pregnancy and early parenthood years are also the times for intergenerational transmission of attachment and family values. 8. The influence of socio-cultural factors on the transition to parenthood should not be underestimated. The parents could be very vulnerable to the judgment and criticism from the society and develop a sense of failure. Camoirano, Andrea. (2017). 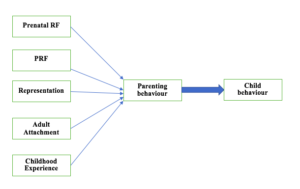 Mentalizing Makes Parenting Work: A Review about Parental Reflective Functioning and Clinical Interventions to Improve It. Frontiers in Psychology. 1. Slade A, Cohen LJ, Sadler LS, Miller MR. 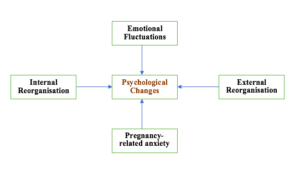 The psychology and psychopathology of pregnancy. In: Zeanah CH, editor. Handbook of infant mental health. 3rd. New York: Guilford Press; 2009. 2. Rethinking maternal sensitivity: mothers’ comments on infants’ mental processes predict security of attachment at 12 months. Meins E, Fernyhough C, Fradley E, Tuckey M J Child Psychol Psychiatry. 2001 Jul; 42(5):637-48. 3. Fonagy, P., Steele, H., Steele, M., Leigh, T., Kennedy, R., Mattoon, G., & Target, M. (1995). 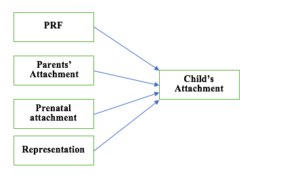 Attachment, the reflective self, and borderline states: The predictive specificity of the Adult Attachment Interview and pathological emotional development. In S. Goldberg, R. Muir, & J. Kerr (Eds. ), Attachment theory: Social, developmental, and clinical perspectives (pp. 233–278). New York: Analytic Press. 4. Meins, E., Fernyhough, C., Russell, J., & Clark-Carter, D. (1998). Security of attachment as a predictor of symbolic and mentalising abilities: A longitudinal study. Social Development, 7, 1–24. 5. Meins, E. (1998). The effects of security of attachment and maternal attribution of meaning on children’s linguistic acquisitional style. Infant Behavior and Development, 21, 237–252. 7. Steele H, Steele M. On the origins of reflective functioning. In: Busch F, editor. Mentalization: Theoretical considerations, research findings, and clinical implications. New York: Taylor and Francis; 2008. pp. 133–158. 8. Galinsky E. The Six Stages of Parenthood. 1st edn. Addison-Wesley Publishing Company, 1987. 9. Stern, D. N. (1995). The motherhood constellation: A unified view of parent-infant psychotherapy. New York: Basic Books.